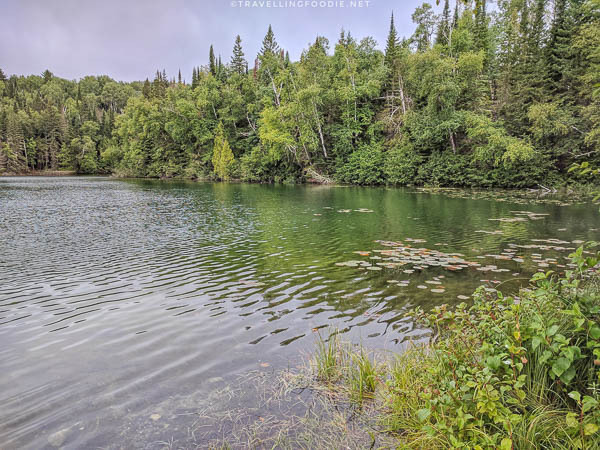 Located in Northeastern Ontario, Timmins is well-recognized in being a four-season destination with over 500 lakes and rivers, numerous adventure and water sports, untamed wilderness, rich mining heritage and small city charm. 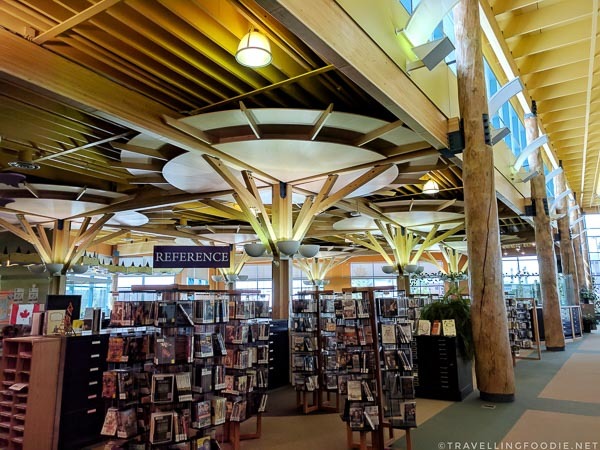 Timmins is known as the “City with a Heart of Gold”, which is quite accurate in two ways: its gold mining history from the Porcupine Gold Rush, and its friendly people with the Northern Hospitality. 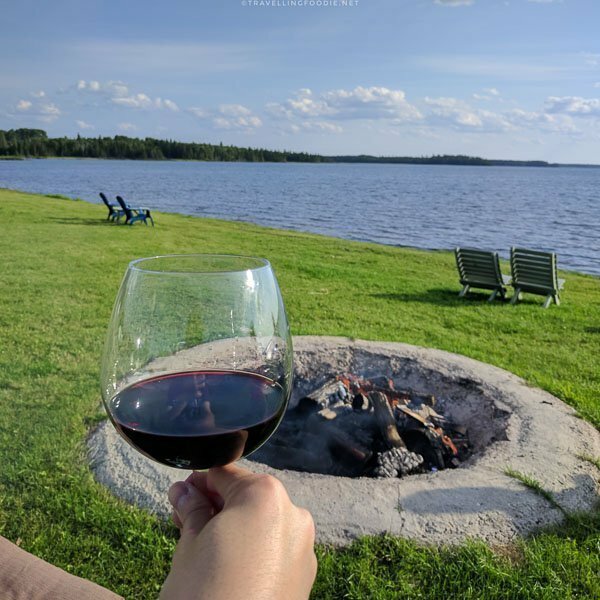 It was my first time being in Northern Ontario, and it was such a unique and wonderful experience! I can also attest to the Northern Hospitality as people were so friendly and welcoming. 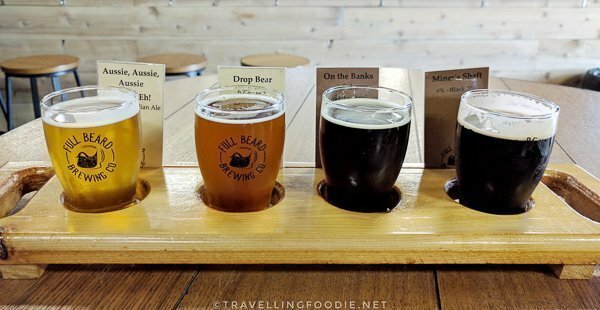 Aside from checking out the Great Canadian Kayak Challenge & Festival, I got to experience what Timmins has to offer, a lot of which are first times for me. 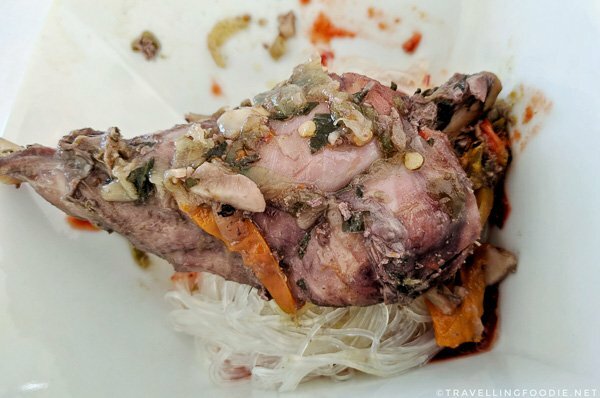 What I loved most is it has a good balance of food, nature and city experiences. Did you know? Timmins is also a great place to observe the Northern Lights due to its northern position and low light pollution. In the five days I got to explore the city, since two days were mostly for the festival, I had a jam-packed itinerary. 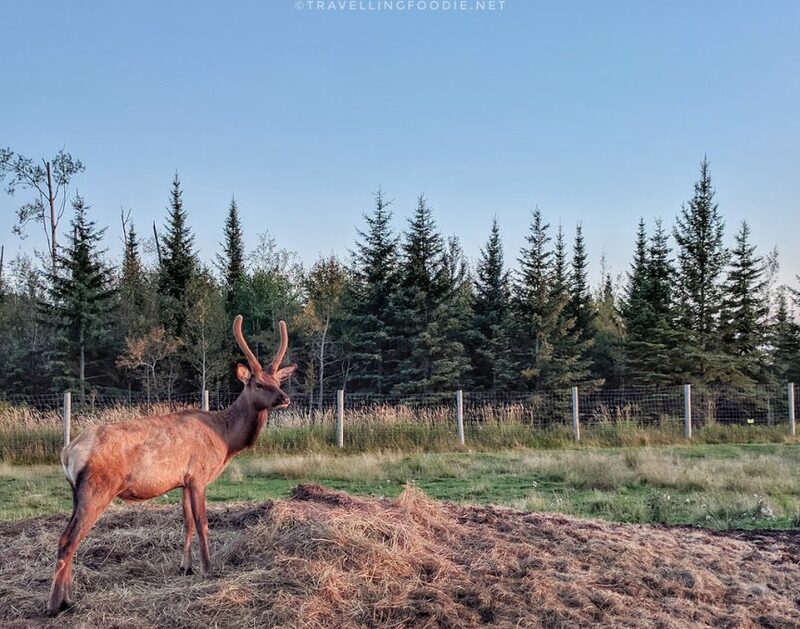 Here’s a guide to 10 food and travel experiences you must do in Timmins, Ontario which includes some of the best things to do, restaurants to eat and places to stay! 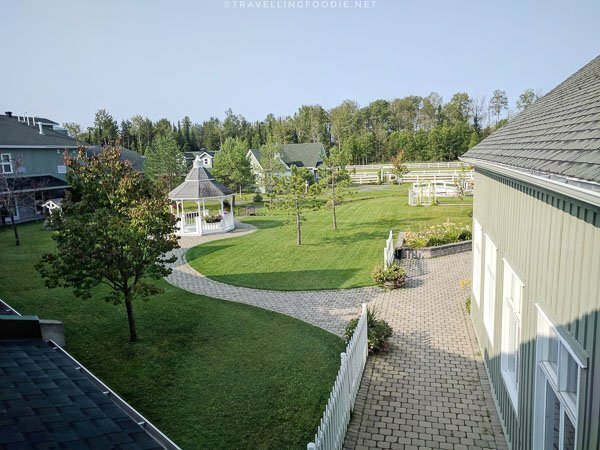 Cedar Meadows is a resort and spa situated on 175 acres of land with 49 rooms/suites and 5 chalets, conveniently located near Downtown Timmins, the airport and the Timmins Square Shopping Centre. There are lots of complimentary parking near the hotel lobby. This resort is like a mini vacation in itself since it has got you covered for everything: place to stay, eat and play. I stayed in the Radisson Suite for four nights. 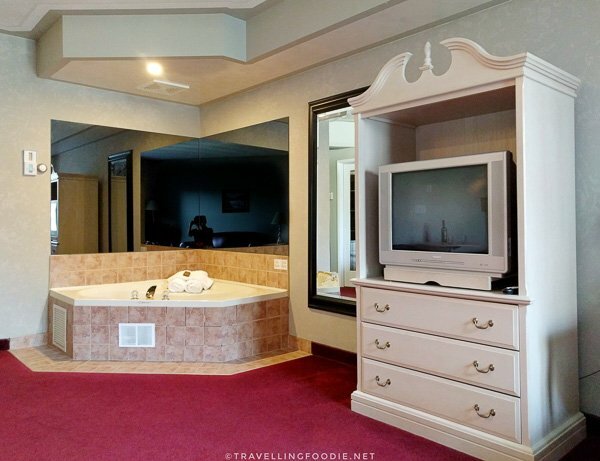 This executive suite was such a nice place to stay, having a bedroom with queen sized bed, a kitchenette without stove, and large living room with jacuzzi, sofabed, a fireplace and a working desk. Looking out the window gives you a view of their gazebo, which is popular for outdoor weddings. 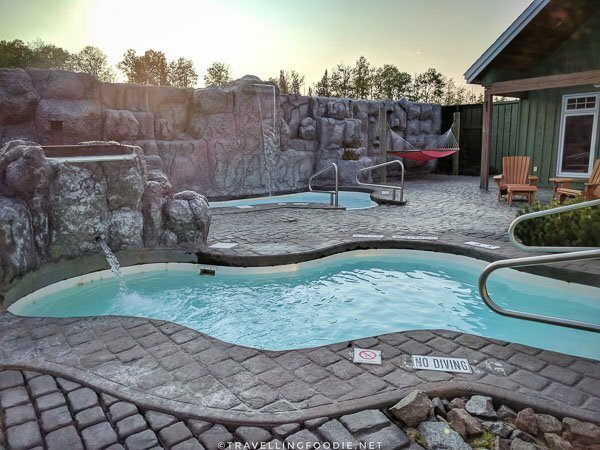 Cedar Meadows is also known for their spa, the Spa Grande Nature, with services like facial, massage, and body treatments. 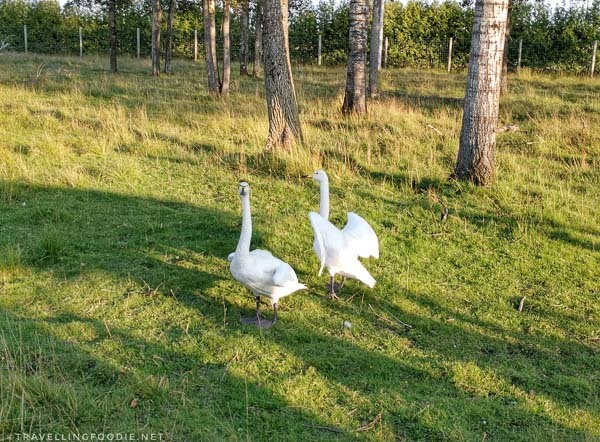 One thing you must do while you’re here is their Nordic Baths. Inside, there’s the relaxation room, steam room, dry sauna and locker rooms. But outside, you’ll be taken into a beautiful oasis with the hot pool, cold pool with waterfall, regular pool and a fireplace. Warming the body for 10-15 minutes in their dry sauna, steam room or hot pool to open up the pores and sweat to release toxins. Cold shock your body by going on their cold waterfall, pool or shower to close the pores, release endorphins and increase the heart rate. Relax for 10-15 minutes on various relaxation areas like hammocks, sitting pods and relaxation room. I loved their eucalyptus steam room as it gives a relaxing scent instead of just the usual smell of steam or sweat in normal steam rooms. 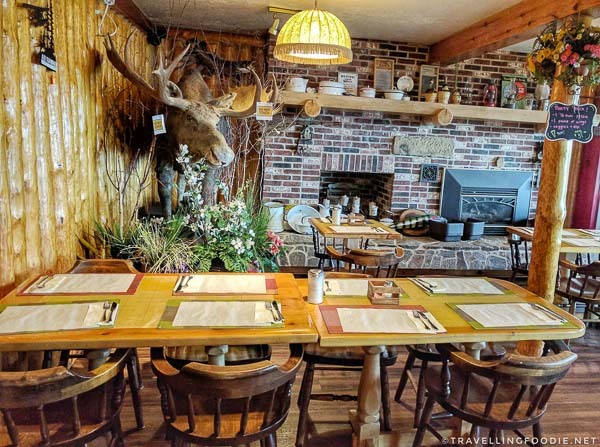 Voyageur Dining Room is Cedar Meadows’ on-site restaurant serving Canadian food prepared fresh daily using all natural ingredients. 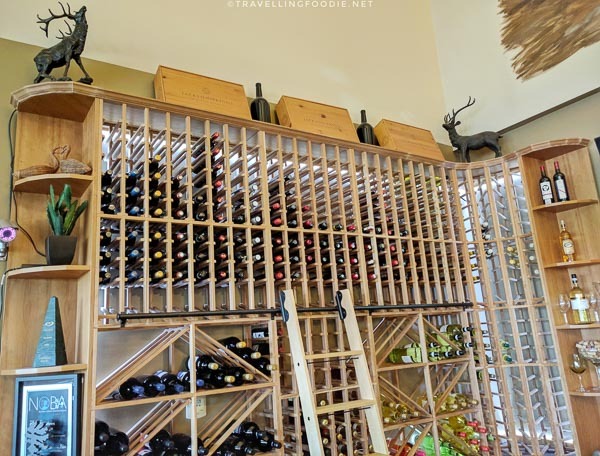 As you walk-in, you’ll find the bar on the left as well as a big wine cellar. On the right is the dining room area. Further along, you’ll find a more intimate and romantic atmosphere that will be good for dates. Did you know? The huge mural painting above the bar was painted by Marie-France Lafleur, owner’s daughter and manager of Cedar Meadows. The people on the boat are actually members of the Lafleur family. This was one of my favourite places for food in Timmins. 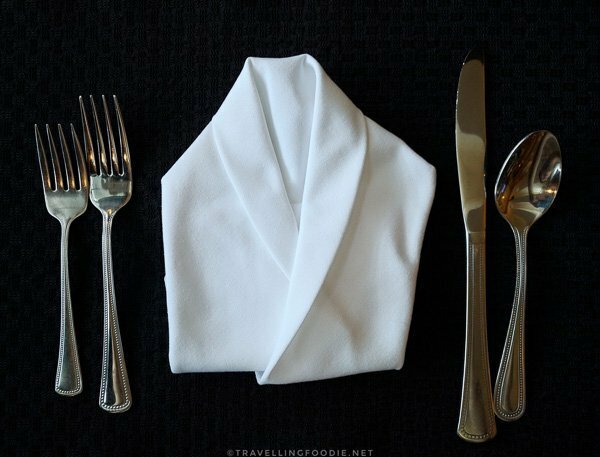 We sat on our table to find the napkins folded into a tuxedo. Complimentary fresh bread came to start. 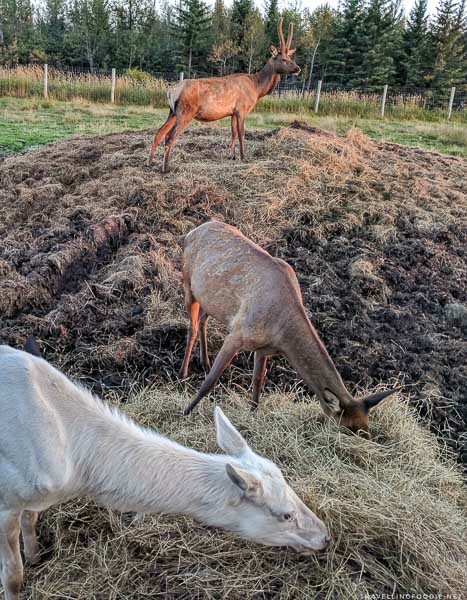 We had a pre-fixe Elk dinner. I had requested to have the Spinach Caprese Salad appetizer changed a seafood appetizer option, and I am so glad I did because the Shrimp Cocktail was delicious with its plump and juicy shrimps. 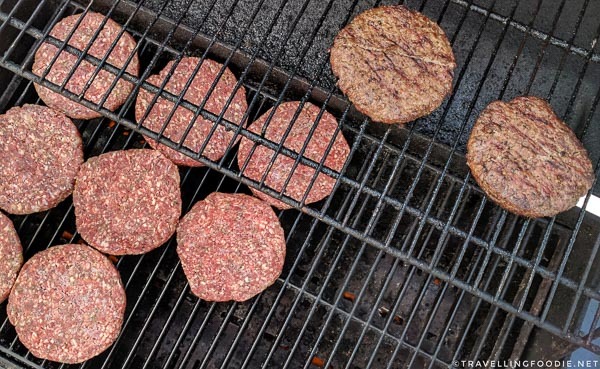 I’ve had Elk burgers before, but the Elk Striploin was just in a different level. The striploin was lean but still very tender and juicy, and the grill really enhanced the taste. The seared scallops were plump and meaty. Since we were having red meat, we opted for a nice Apothic Red which I found went very well as the blend helped bring sweetness to the gaminess of the meat that most people may not normally enjoy. 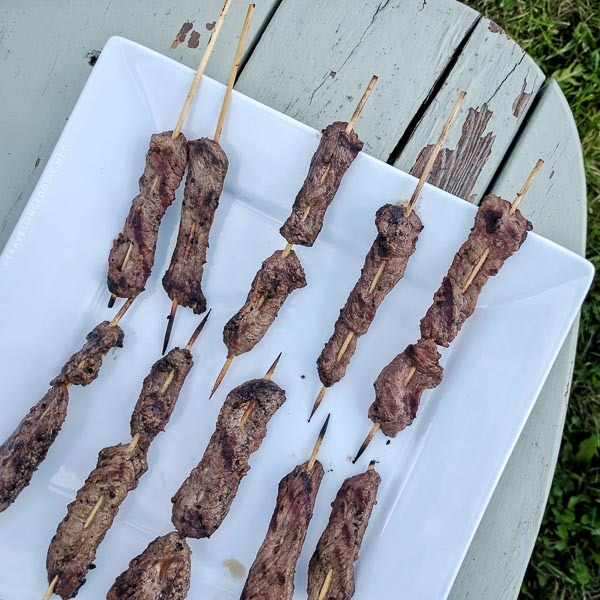 One thing I learned is that medium rare for elk striploin looks medium / medium-well because of how lean the meat is – there’s not a lot of blood. 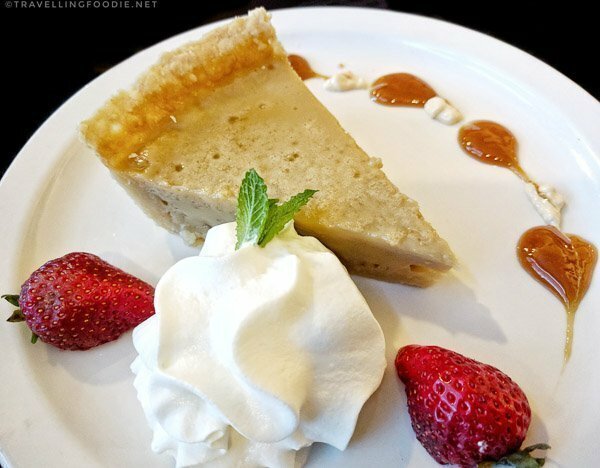 Portage Pie was our dessert, and it was very different from what I was expecting – it was so much better! 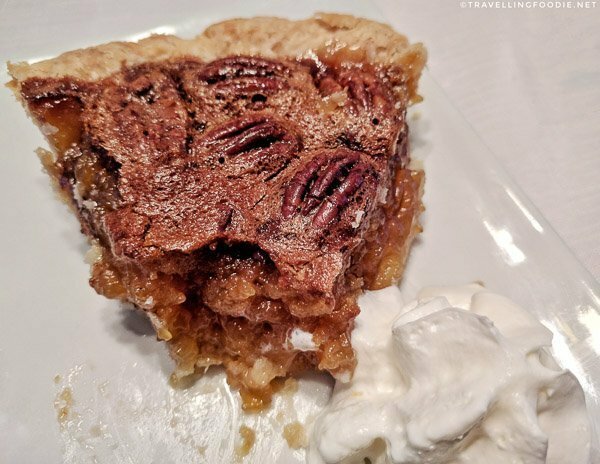 The texture of the pie is very custardy with strong taste of maple without being too sweet. 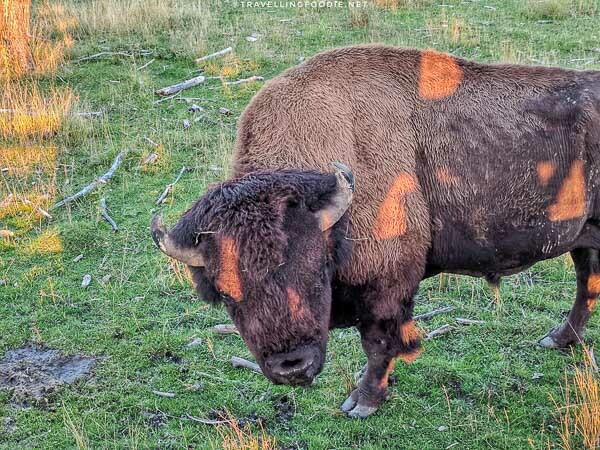 Cedar Meadows also has a Wilderness Tour which I highly recommend especially if you love seeing wildlife. The tours run everyday at 3:00pm, rain or shine. During summer, 7:00pm tours are also offered. 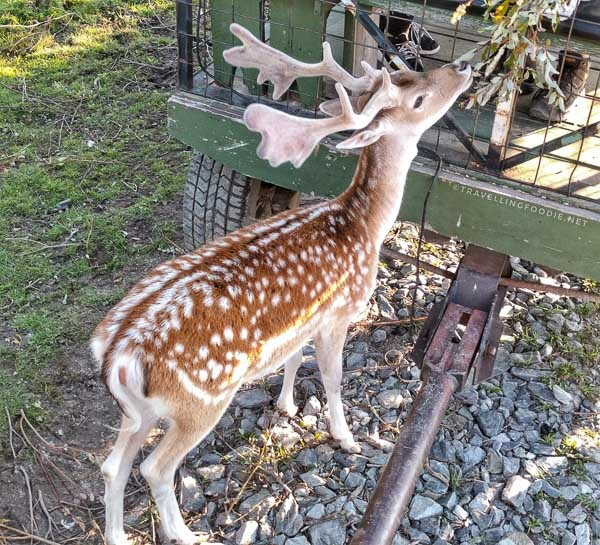 You ride in a tractor drawn wagon thru their 100 acres of wildlife park. The wagons are semi-caged for safety and high enough that you are taller in height than the animals when standing up. There are a lot of animals in the park. The ones I got to see were swans, deers, elks, cow, bison, moose, and ducks. 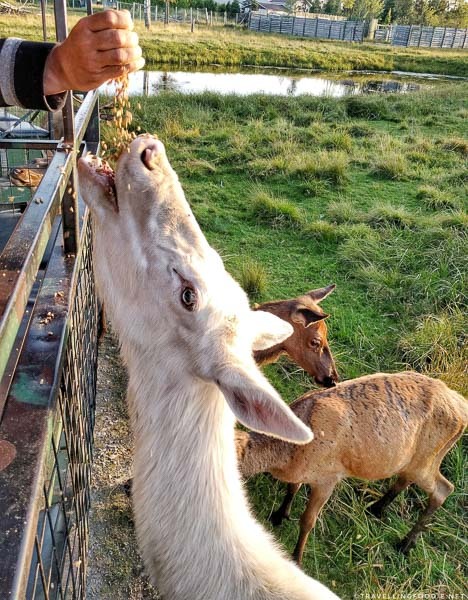 You can pet and feed the animals. 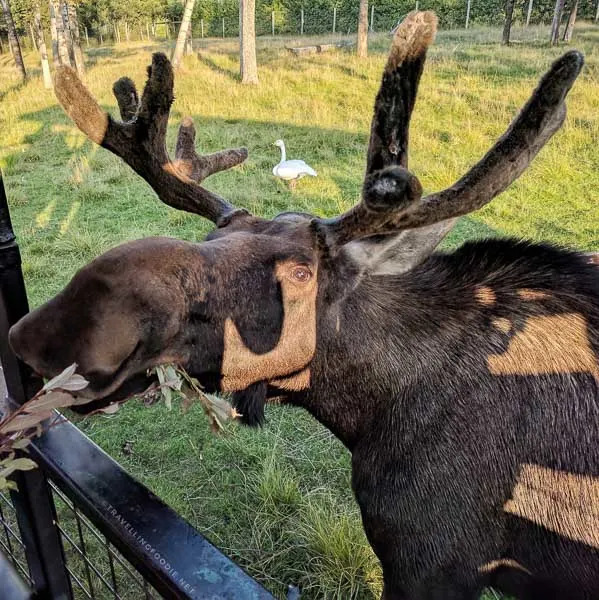 I also got to see a moose in person for the first time! I was so a-moosed! 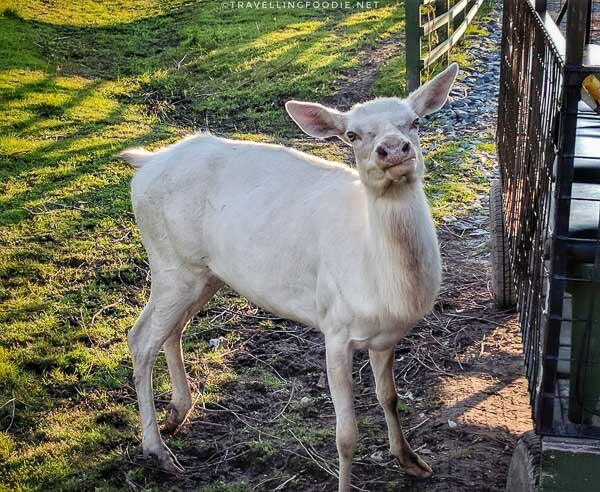 Probably the cutest for me were the deers as they reminded me of Bambi. 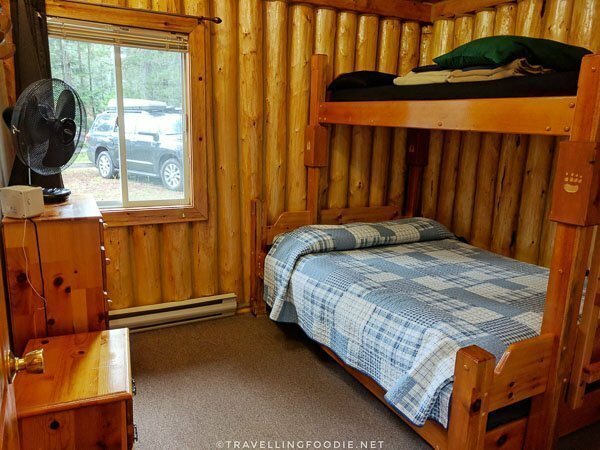 Located right by Kenogamissi Lake, around 40 minutes away from the city core of Timmins, WildExodus gives you a camping experience to remember in Canada’s vast Boreal forest in Northern Ontario. Did you know? 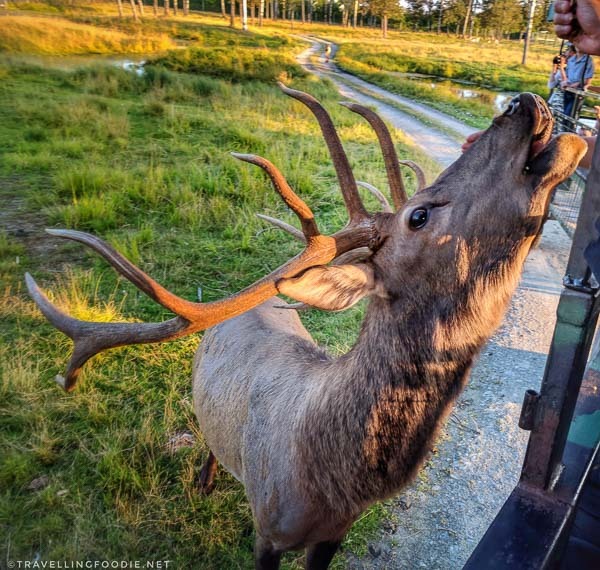 WildExodus’ four-star glamping experience is both a Canadian Signature Experience (CSE) and an Ontario Signature Experience (OSE). 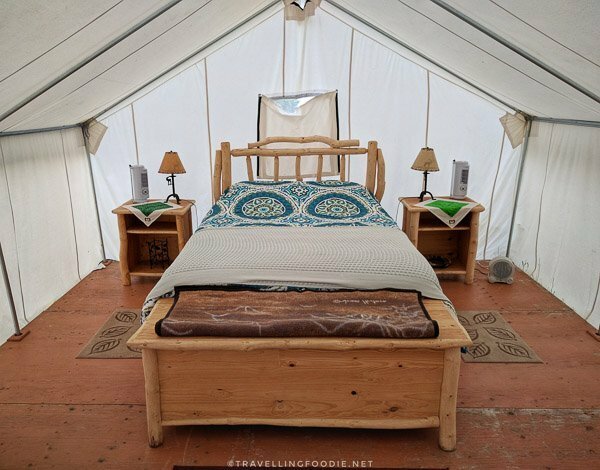 If you’re someone who doesn’t want to do actual camping but want to experience sleeping outdoors in nature, then definitely try glamping (or glamorous camping). It was my first time glamping, and it was definitely the camping for me. 🙂 The best I can describe it is camping but in a hotel room. 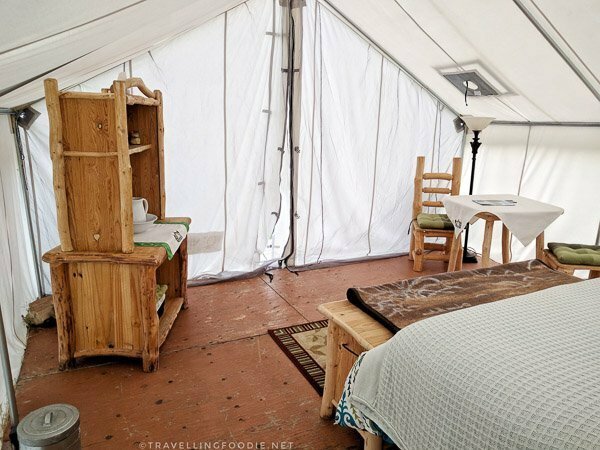 The glamping tent is a canvas tent with raised flooring. 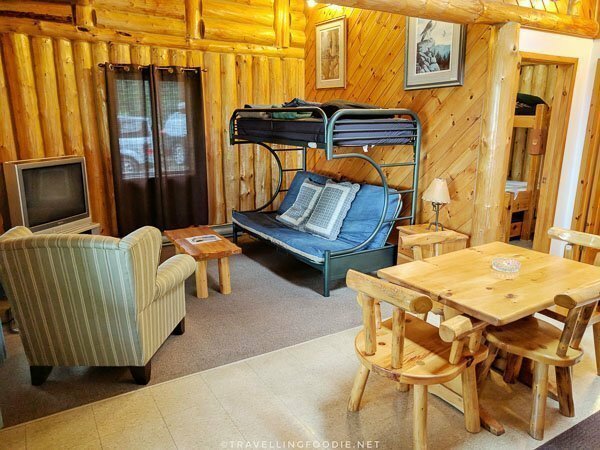 Inside the tent, you’ll find some nice log furniture and queen bed… and hydroelectricity – a win! If you’re a light sleeper, you may want to bring ear plugs or ear phones as you are likely to hear sounds of nature inside the tent. I heard rain and wolves howling from the distance in my tent. Though there are no washrooms inside the tent, there are public washrooms with shower available. Travelling Foodie Tip: Make sure you do everything you need to do in the washroom before sunset because visibility to get to the washroom is hard after. 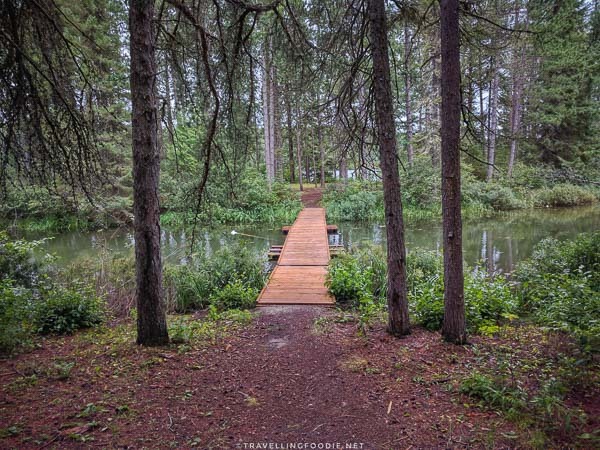 Since WildExodus is surrounded by the Boreal forest and Kenogamissi Lake, there are so many outdoor adventures to do. You can do paddling, fishing, hiking, and more. They also have a pontoon boat cruise which I got the chance to try. It was my first time riding a pontoon boat. 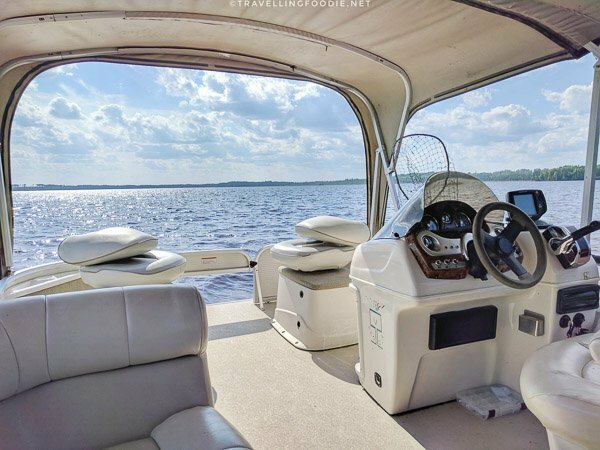 It’s much more luxurious than other boats with more room and sofa-like seats. We cruised thru Kenogamissi Lake, taking in all the beautiful scenery and passing by some interesting cottages. 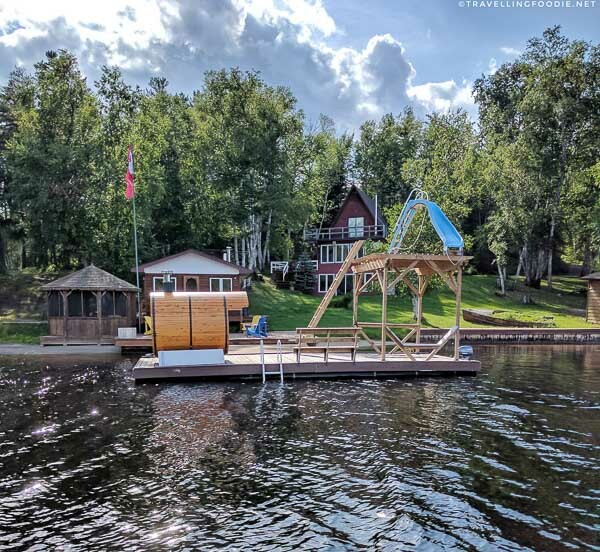 I saw this interesting cottage where the dock has a sauna as well as a slide that slides on to the lake. Did you know? Kenogamissi Lake is a man-made lake. 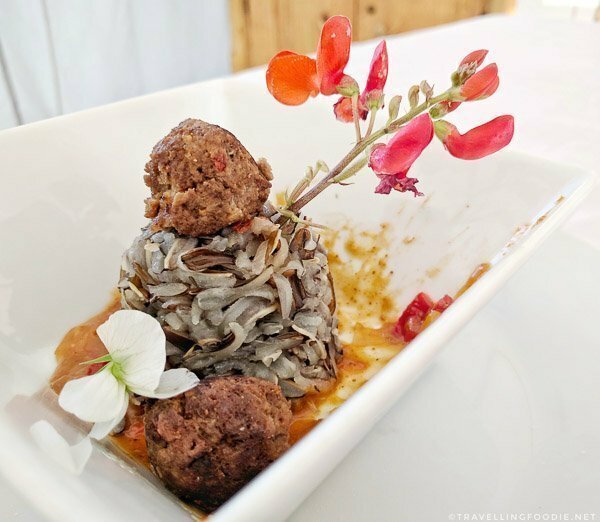 You cannot end your experience without having some of their delicious native cuisine! This is one thing I was expecting to experience culinary-wise for this trip. 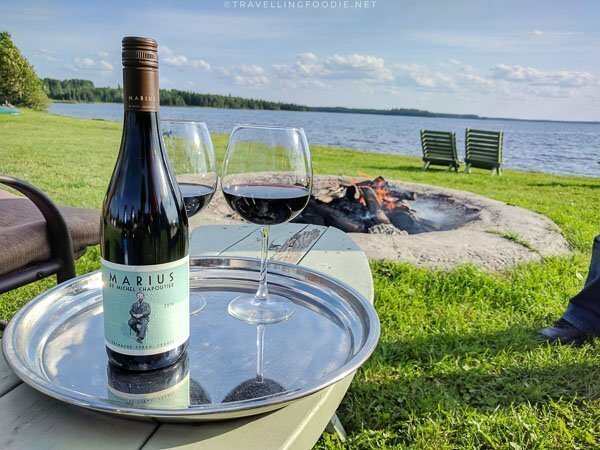 After returning from the cruise, the campfire was setup where we got to enjoy some delicious Elk Skewers and sip thru red wine (Marius by Michel Chapoutier) while enjoying the view of the Kenogamissi Lake. Sipping thru Marius by Michel Chapoutier. I learned about this great wine in this trip! Love it! The main CSE dinner occurred in one of the canvas tents where we had a four-course meal. 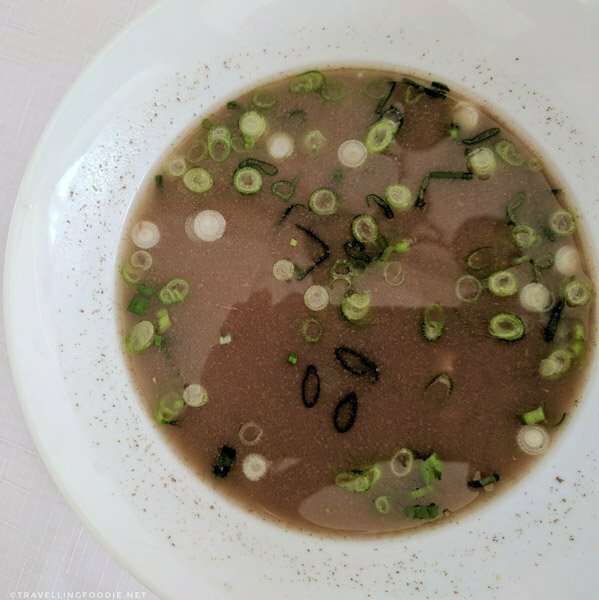 We started off with some bison barley soup which was a great way to warm up since it was getting cold outside. The rabbit cacciatore was quite interesting. 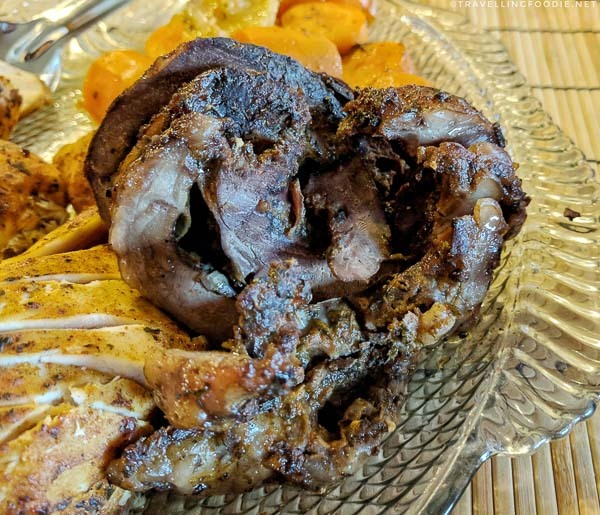 It looked like chicken and had similar texture, but it was also so much different: slightly stronger and meatier, but still quite tender. My favourite dish that night was the wild boar meatball. The meatball was lean but still juicy, and very flavourful. It didn’t taste exactly like regular pork but more like a cross between pork and beef. The sweet curry sauce helped mask any gamey taste you might find too. The last course was a seafood platter so a bottle of white wine was paired. 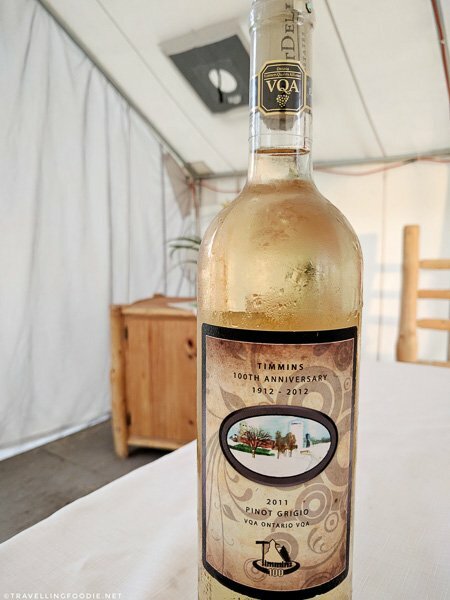 The wine was a Timmins 100 Pinot Grigio, one of the five exclusive wines made specifically for Timmins during its 100th anniversary where 50c from each sale was donated to the City of Timmins 100th Anniversary Committee. 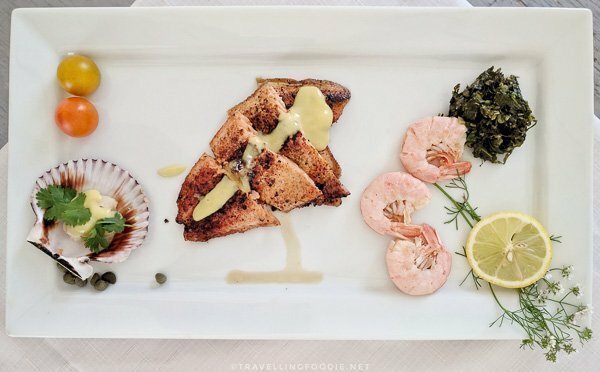 My favourite in this platter was the arctic char as it was full of flavour and paired well the most with the wine. 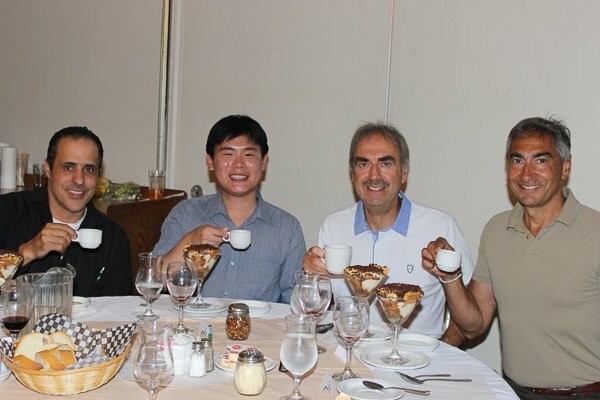 For dessert, Guy Lamarche brought his mom, Pierrette’s, homemade pecan pie. The pie was just the right sweetness for me and went perfectly well with a cup of coffee. The crust was perfectly flakey and buttery. The filling has a very unique texture because it is thickened with eggs instead of starch. I did wish there were more pecans. 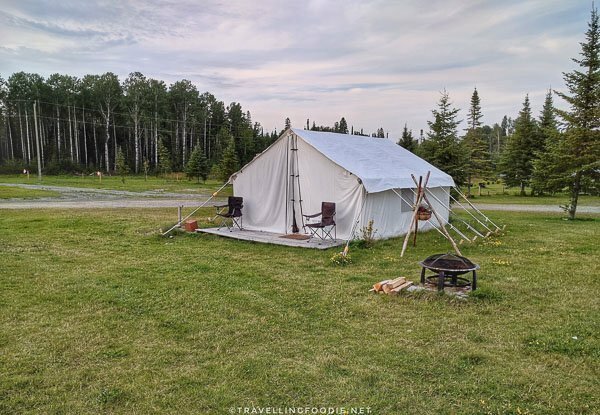 Though not exactly in Timmins, Air Ivanhoe is an awesome outdoor retreat in a little town called Foleyet in Sudbury, around a 1.5-hour drive from Timmins. Right by Ivanhoe Lake, the main lodge is the Ivanhoe River Inn and is your starting point for everything. Air Ivanhoe is a family-run business operated by the wonderful and friendly Theriault family: George, Jeanne, Joel and Daniela. There is a lakeside cafe as well as a general store which also sells fishing, hunting and camping supplies, gasoline and more. Inside the Lakeside Cafe. There is also an outside patio with views of the Ivanhoe Lake. 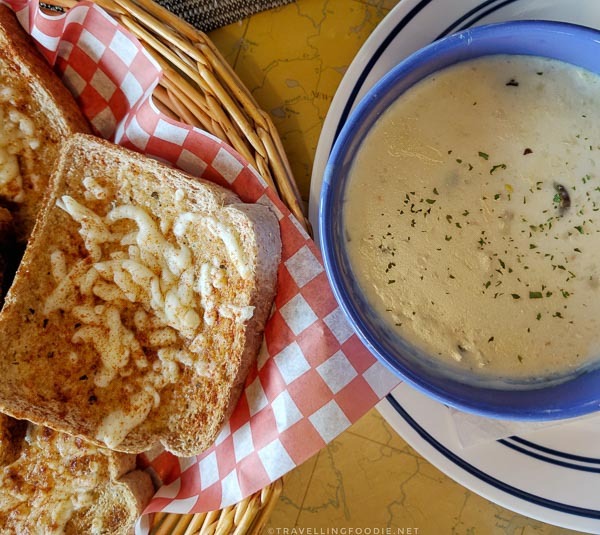 The lakeside cafe is open from Thursday dinner until Sunday lunch with quite an extensive menu including various appetizers, soups and salads, sandwiches and burgers, pasta and pizzas, and desserts. I love cream of mushroom soup so would definitely recommend their cream of mushroom soup which uses real mushrooms. Wild blueberries are quite popular in this region as well, and blueberry picking in the bushes is a common activity. Unfortunately when we ventured out to the wild to do some blueberry picking, there were provincial signs saying that pesticides have been used in the area so we came back empty handed. 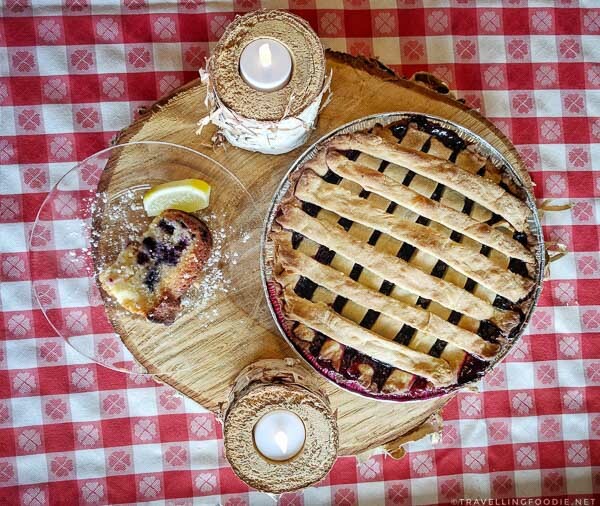 Lucky for me, Jeanne still had her own share of wild blueberries for us to have in making the delicious and fresh wild blueberry pie. 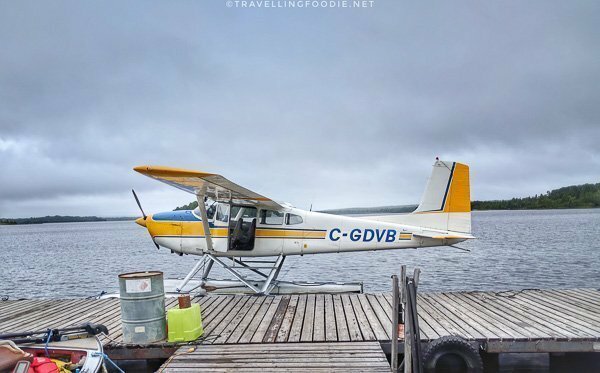 One of their unique experiences is their fly-in outpost cottages and boat-in river cabins. These are Air Ivanhoe’s cabins and cottages by the lake or river that are only accessible thru float planes or boats. If you want a truly isolated getaway experience, this would be it. 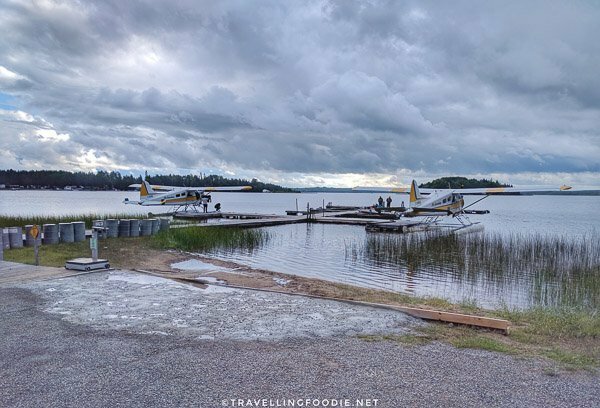 I was supposed to do fly-in fishing and shore lunch in one of the fly-in areas (though not staying overnight) but was unable to because of the weather. 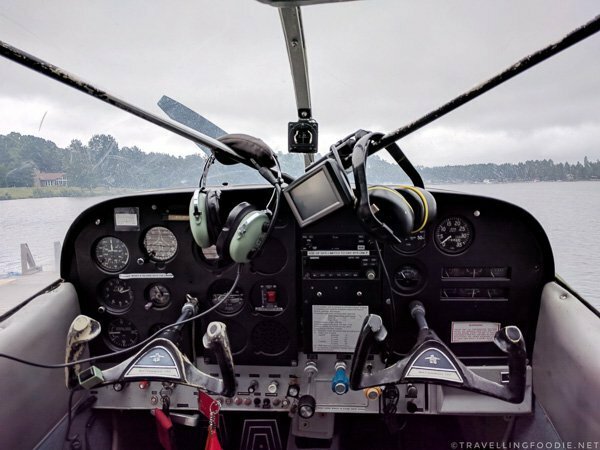 I did get the chance to ride a float plane for the first time. 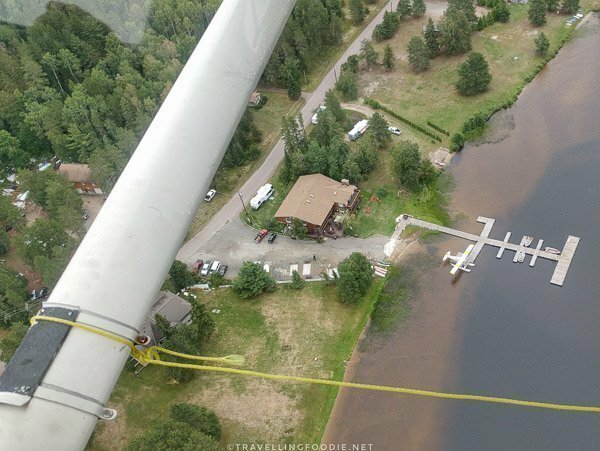 It was such a neat experience since it is so much different from riding an airplane – quite unique to feel how it takes off and land on the lake, as well as have a beautiful aerial views of the lake and Ivanhoe Lake Provincial Park. 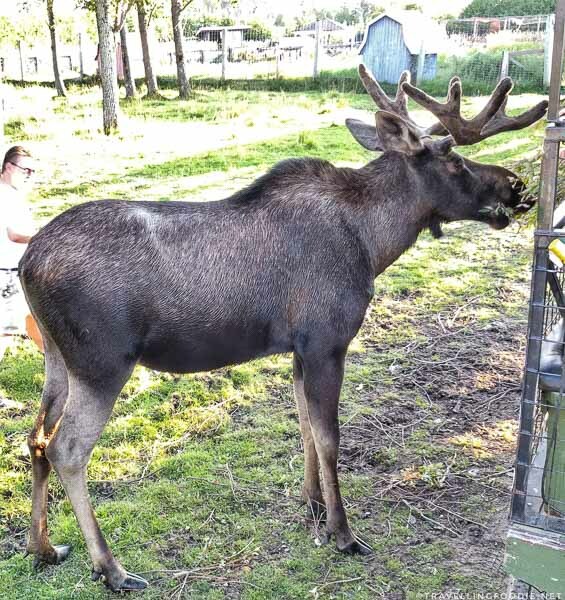 Hunting is quite a popular activity up north as well due to the number of wild animals they have. 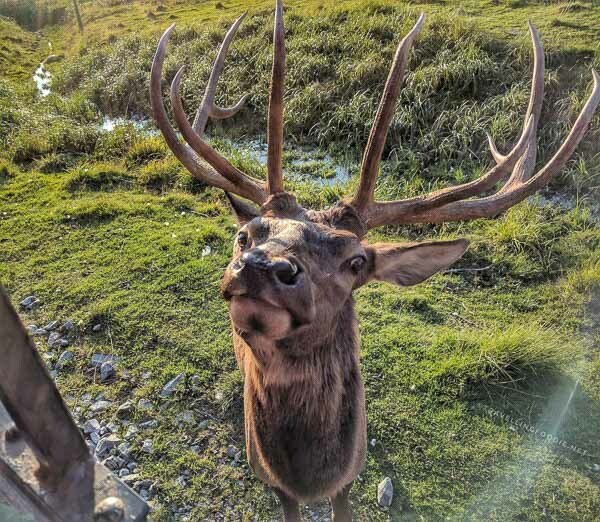 Air Ivanhoe offers different kinds of hunts like moose, bear and small game hunting. Though I didn’t get to do hunting, I did get to fire a Ruger 10/22 Rifle for the first time (or any firearm at that). It was a lot of fun, especially trying to properly aim a target. One thing I learned to my surprise is you actually need to have both eyes opened when aiming even if your other eye is on the scope with a zoomed vision. Your eyes will just adjust on their own. Maybe it was because I played a lot of first person shooting games, like Counter-Strike, as a youngster, but I was told my aim was on point for a first timer LOL. I stayed in their Cottage Log Suite ($100/night Single) which is 480 sq. ft. with vaulted ceilings and carved from native timber. 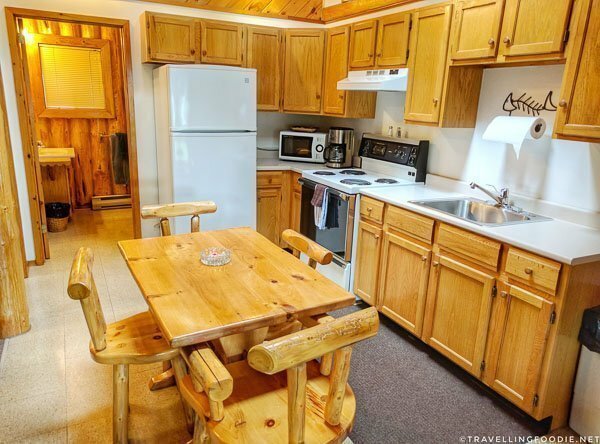 The suite has a 4 piece bathroom, 1 bedroom and a living room carved from native timbers and a full kitchen. Outside each suite has a front porch with grill. 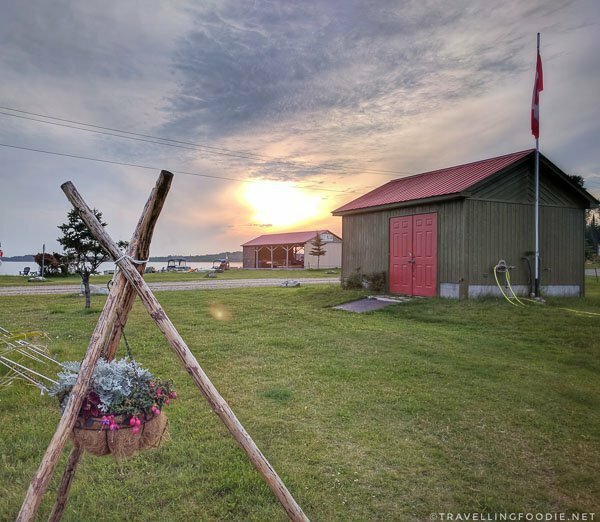 It’s perfect if you want to have an outdoor experience at a cottage where you can cook and do BBQ. 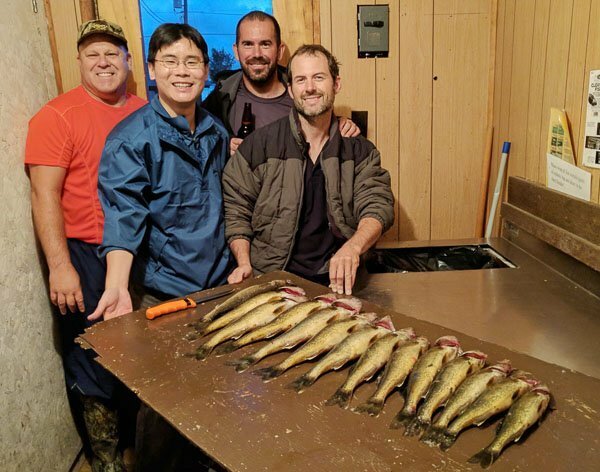 Being by the lake, you will definitely want to do some fishing as there is an abundance of fishes to be caught in Ivanhoe Lake. 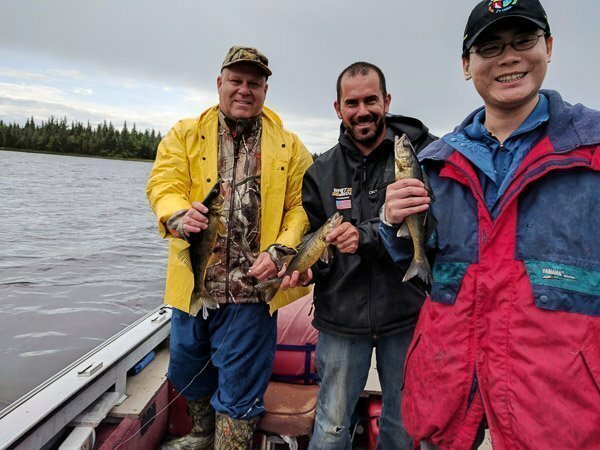 Boat fishing with Dave (left), Victor (middle) and myself. Joel took the photo. We each caught a walleye pretty much at the same time. We went fishing on the first day and caught 14 walleyes, having caught 3 of them myself! This was my second time fishing but my first time catching walleyes. We took them all back to the inn and I got to see how they filleted the fish. David, Victor and Joel ready to fillet the walleyes for a fish fry! 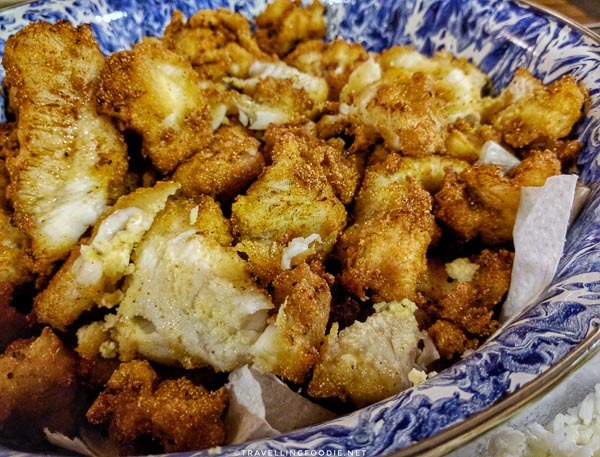 What better way to have the 14 freshly caught walleyes than having a fish fry feast! 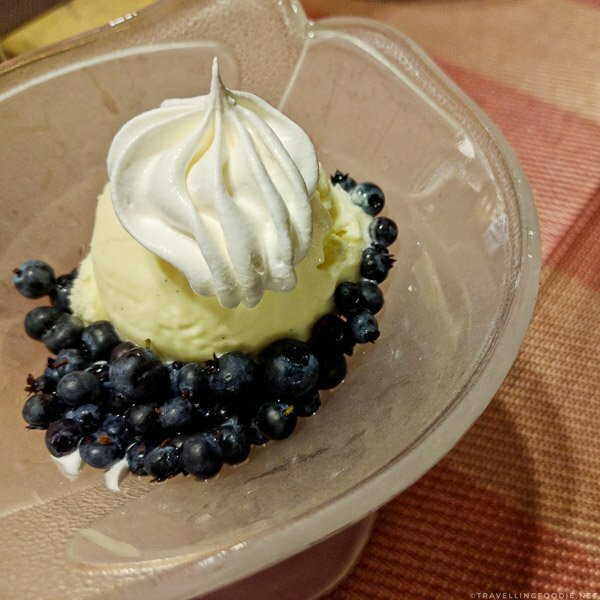 Capping it off with some delicious wild blueberries with ice cream. Another first for me was getting to try a bear’s heart. Because of how lean a bear’s heart is, it actually felt like eating a sirloin steak – very lean and meaty. 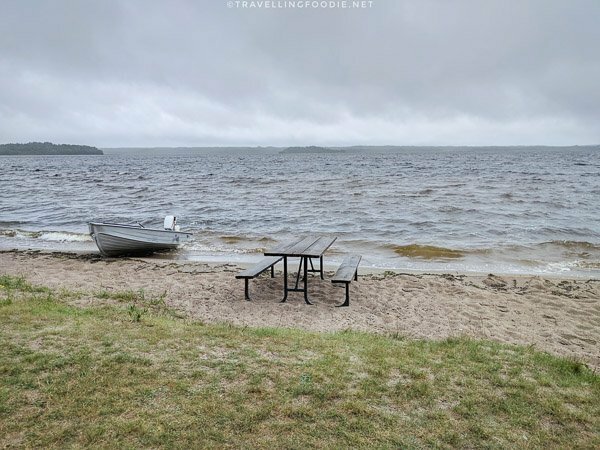 While you’re at Air Ivanhoe, you’ll definitely want to visit Ivanhoe Lake Provincial Park as well. 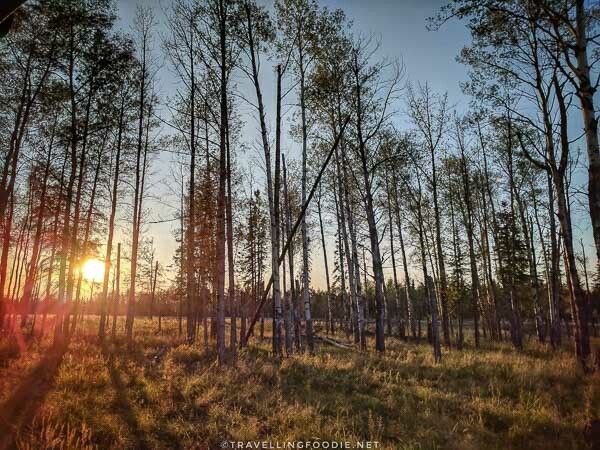 Ivanhoe Lake Provincial Park features scenic views including a number of glacial features like eskers, kettle lakes, one of which has become a quaking bog. 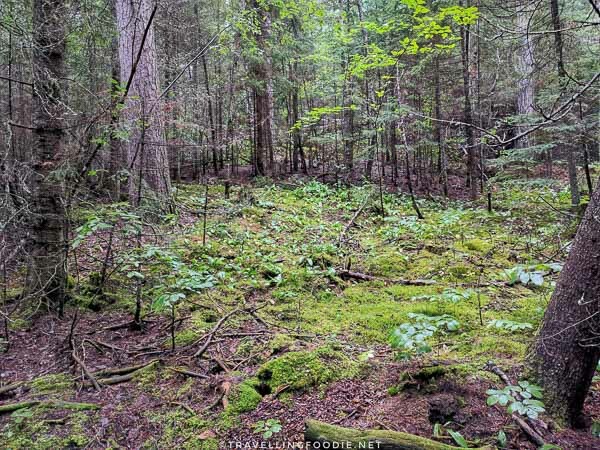 Since it is part of the Boreal Forest, you will also find some interesting plant species. 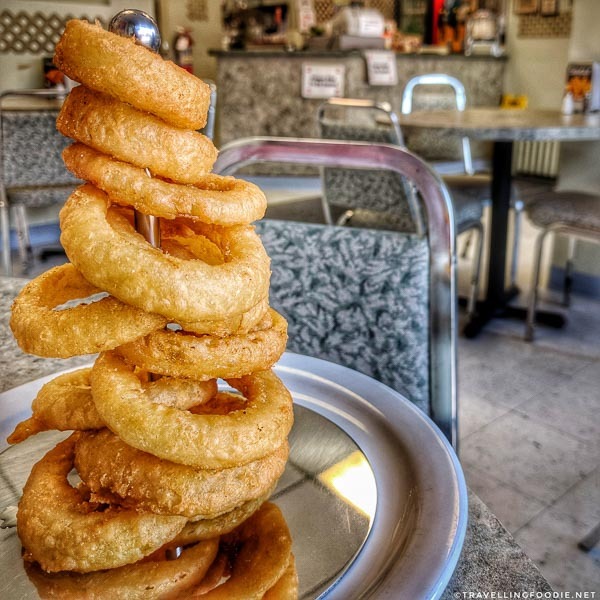 Pine Dairy Bar is one of the oldest food establishments in Timmins, having been in business since 1952. 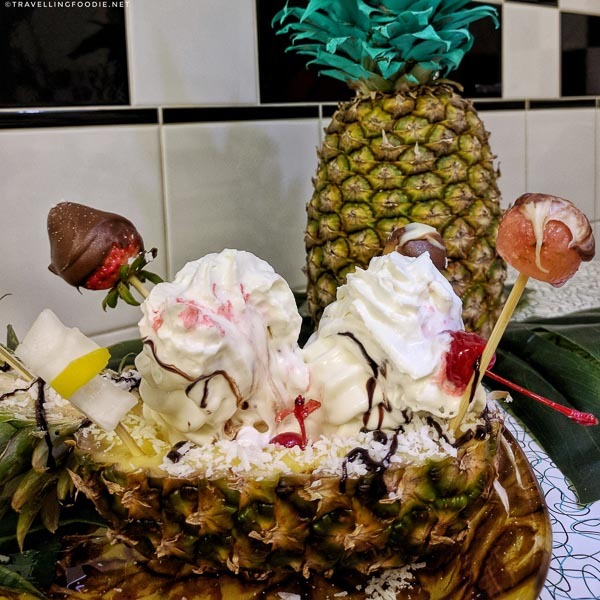 They are popular for their dairy products ranging from soft serve, sundaes to ice cream smoothies and cakes. They have introduced a healthy lunch and dinner menu as well. 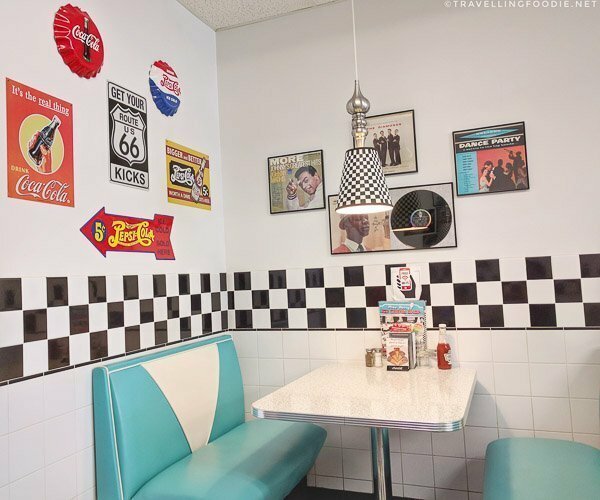 They have a 50’s Diner theme going on which I loved since there’s not a lot of this kind of diner-type restaurants around anymore. P.S. I’m a big fan of Archie Comics when I was young so places like this make me feel like being in Pop’s Chock’lit Shoppe. 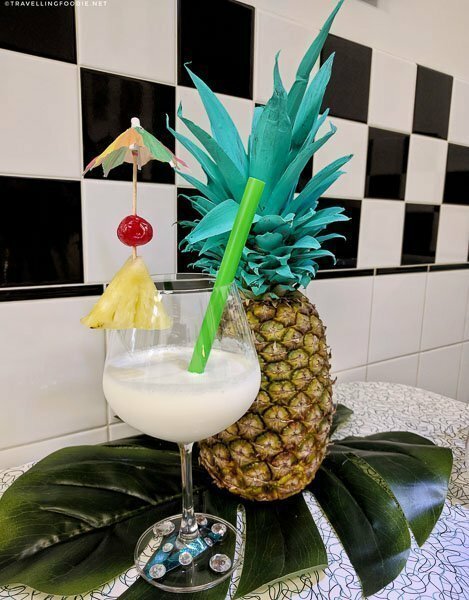 I really liked the pineapple banana smoothie. 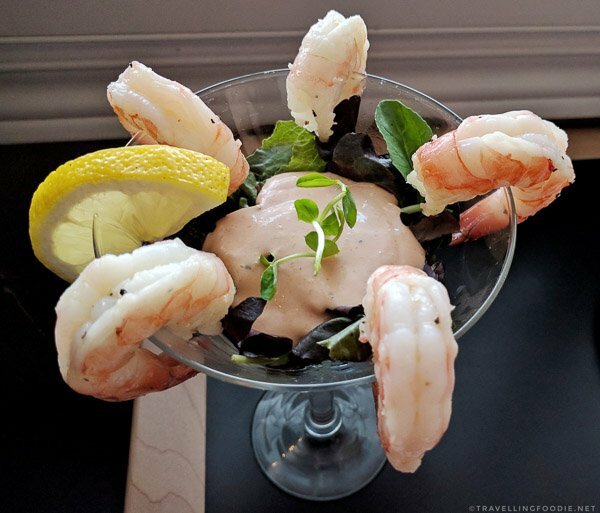 The texture is very creamy and smooth – you won’t get the crushed ice texture. I like that it wasn’t too sweet and you can still taste the pineapple and banana. 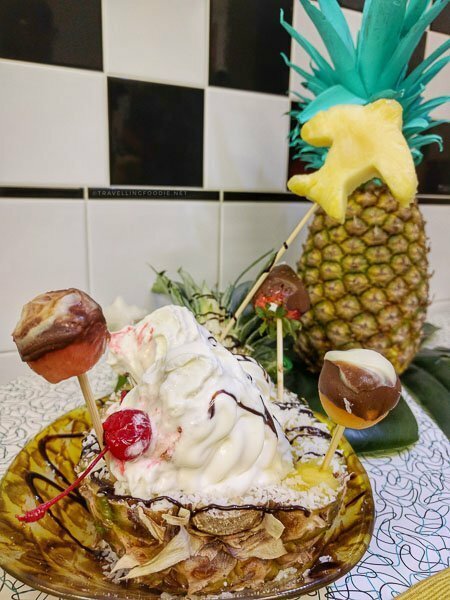 The mothership arrived when we saw the Piña colada ice cream with coconut ice cream sundae served in a pineapple. What a beauty! The ice cream sundae was rich and creamy. I really enjoyed the Piña colada ice cream because the tropical taste was quite refreshing and a good change from the usual flavours. A note of caution when trying these two flavours together, eat the coconut ice cream first because coconut is subtler in taste. Otherwise, it’s hard to taste the coconut if you go for Piña colada first. 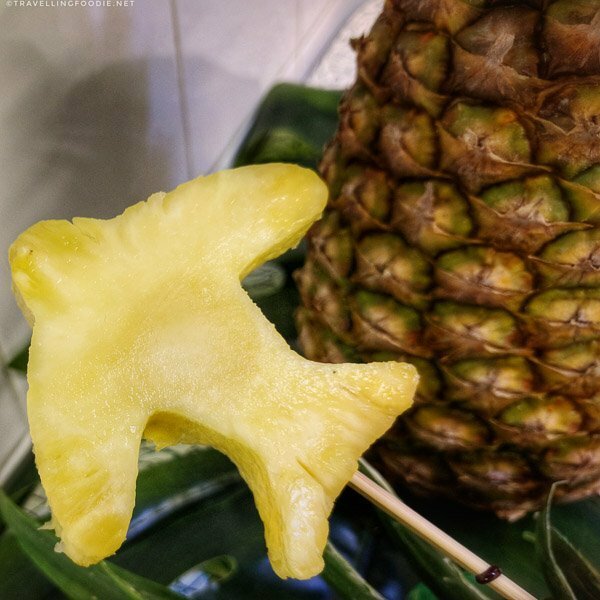 It also came with chocolate coated fruits, and pineapple slices shaped in airplanes! Owners Jeannine and Dany said they did airplane because I travel a lot being the Travelling Foodie. Thanks for making it extra special! These kinds of presentation and table setup can be specially requested with them so it’s a good way to make things extra special for occasions and events. Last dessert was the vanilla soft serve. It was very rich and creamy, probably one of the best soft serve I’ve had. I also like the texture because it is quite dense and holds together unlike most soft serve that falls apart quickly. 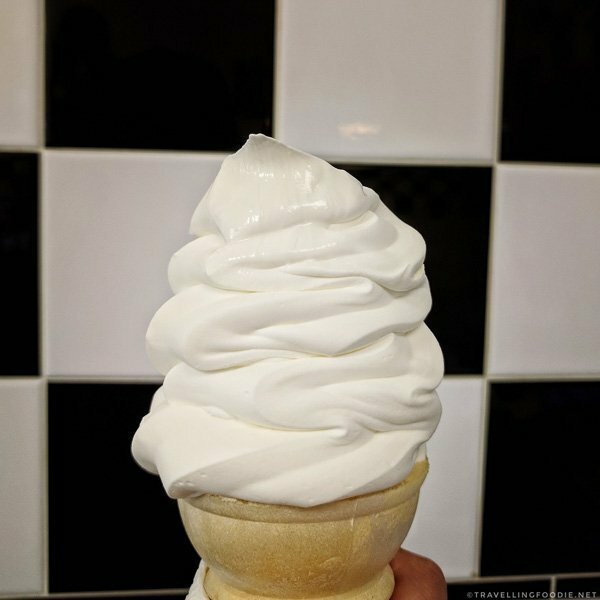 Their soft serve is also similar to Blizzard where you can flip the cone upside-down and it would still be intact! They recently spent at least 150K in equipment upgrades to improve their products even more. 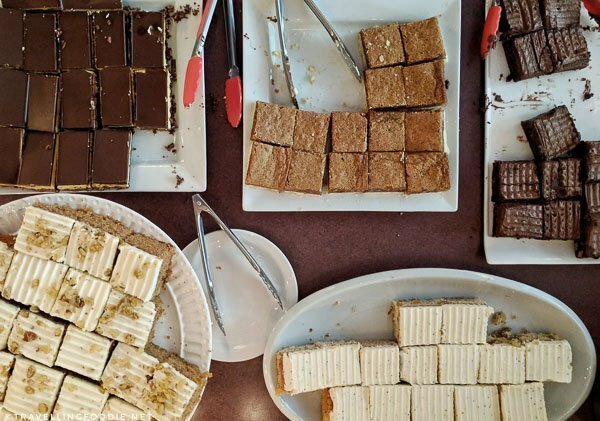 Coffee Warehouse is a market, bistro and cafe all in one huge space with over 500 healthy delicious food and drinks made fresh daily. It’s hard to imagine that this once clothing store is now such a foodie haven. It has a pasta bar, stir-fry station, espresso bar, juice bar, acai bowl bar, deli and sandwich bar and more. According to owner Marc Soucie, they are even adding a pizza station and cheese bar. A must get is their Montreal Smoked Meat sandwich, using smoked meat from Dabrowski’s Smoked Meats. 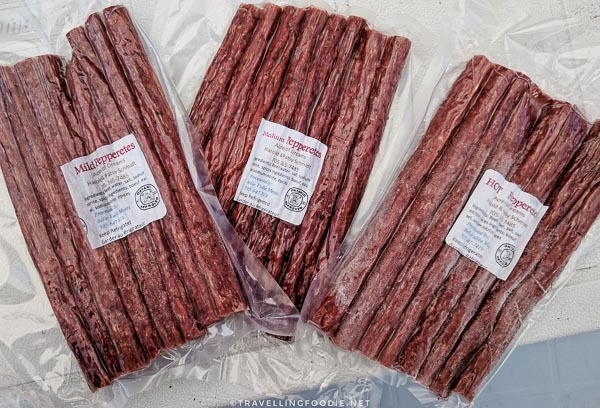 They use the lean meat so it’s healthier, and it’s still equally flavourful and juicy as the fatty smoked meat. Be sure to add black truffle oil, and thank me after! They make their healthy juices really well. I tried the Carrot Fixer and it was so good that I didn’t even feel like I was drinking a vegetable-based drink! I loved the fresh hot food stations they have because you’re sure they are made fresh, and you also get a nice show since you get to watch them make it right in front of you. I really enjoyed the Spicy Basil Beef in the stir-fry station. The beef was tender and the mix of ingredients was just so fresh and good. If you avoid spice, it really wasn’t that spicy. I opted for the rice noodles instead of the egg noodles it usually comes with, and I preferred it for the chewiness it brought to the dish. Coffee Warehouse has a nice outdoor patio as well with ample seating. 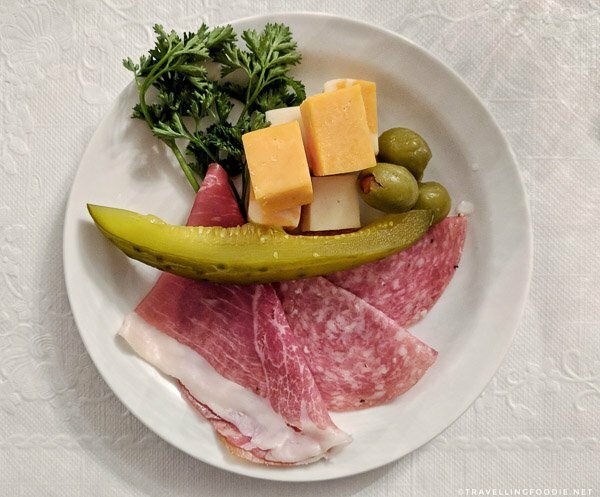 If you’re looking for authentic Italian food, there’s nothing more authentic than the Porcupine Dante Club. 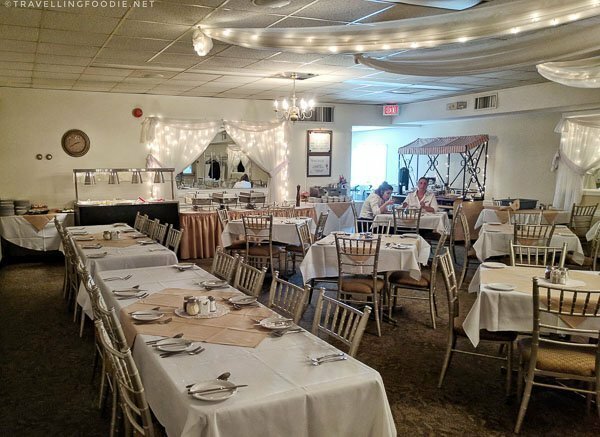 The Dante Club was formed in 1952 by Italians with the main purpose of creating a place to call home for Italians living in Timmins where the Italian culture is preserved and they can speak in their native language. The club also has banquet halls and conference centre which are popular for weddings and meetings. 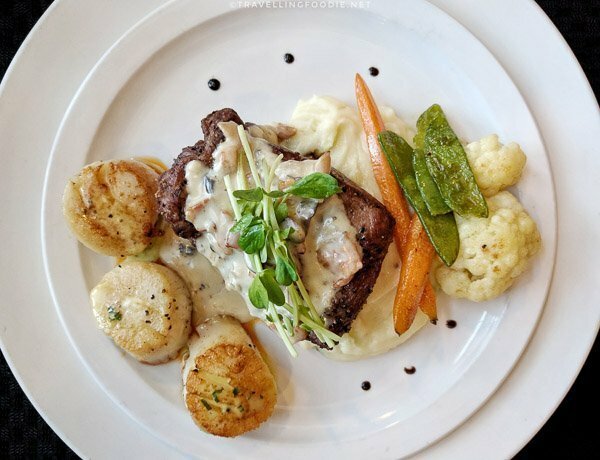 La Gondola Restaurant is open Thursdays and Fridays for both lunch and dinner. 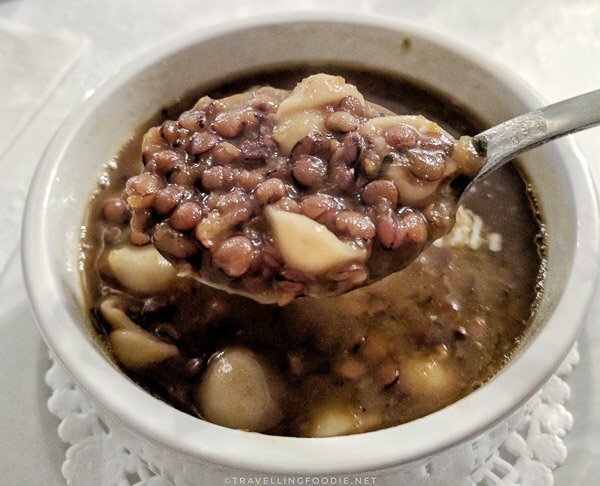 The homemade lentil soup was one of the better lentil soups I’ve had, though I found it could do with less salt. The lasagna was so full of flavour with the mix of herbs! The tomato sauce was just right as I normally don’t like it when it’s too sour, and it went so well with the beef. 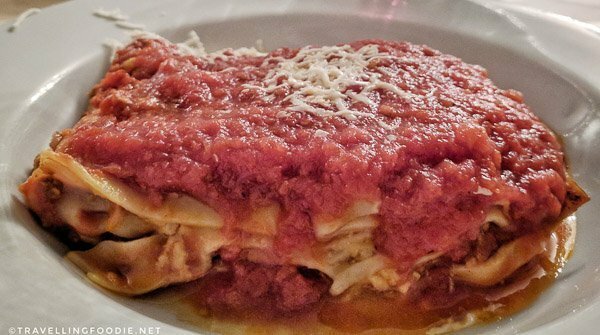 One thing I learned was that, though traditional Italian pastas go for al dente, this is not the case for lasagna which is traditionally made as soft. 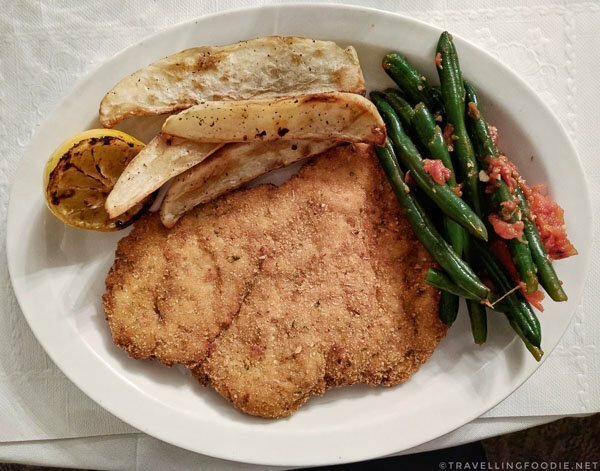 The chicken cutlet was done perfectly with a delicious crispy breading with parmesan and basil. The chicken was very tender and juicy inside. My go-to Italian dessert is always tiramisu, and this one hit the spot. 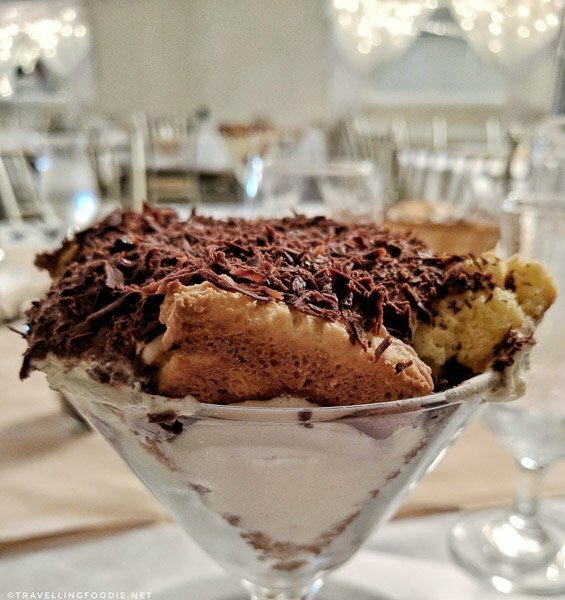 One thing that makes their tiramisu even better is they use shaved chocolate instead of cocoa powder for toppings. If you want variety or want to eat fast, the restaurant also has a lunch or dinner buffet. 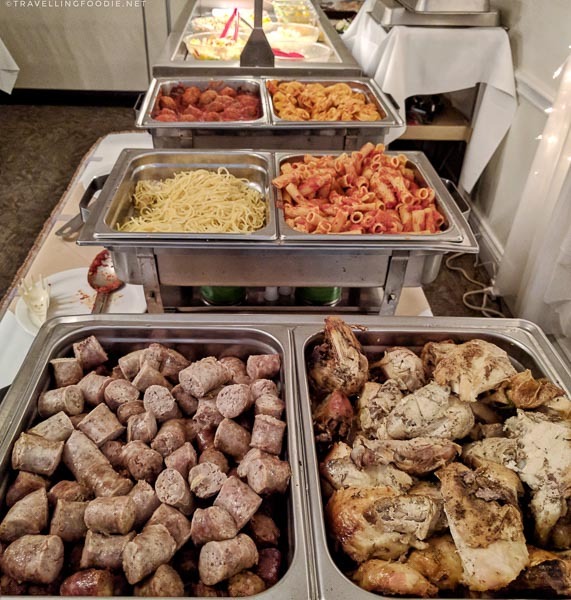 Lunch Buffet offers pasta and meat dishes. Dinner buffer offers the same plus extra higher end dishes. 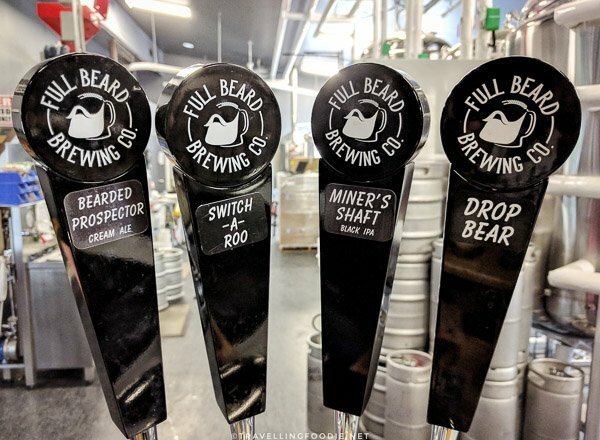 Website: Full Beard Brewing Co.
Full Beard Brewing is the currently the only craft brewery in Timmins. 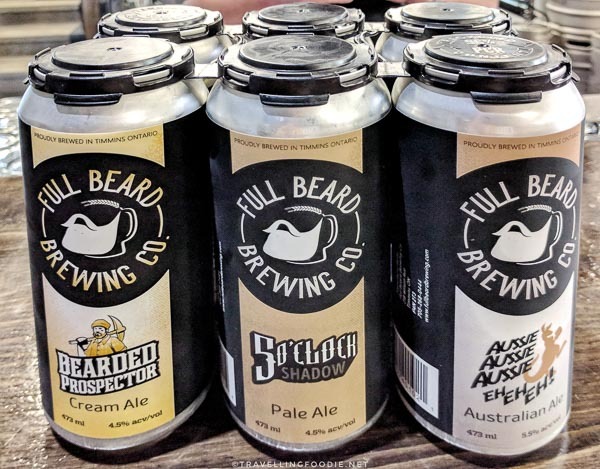 Though locals have been enjoying its flagship 5 O’Clock Shadow Pale Ale at pubs and restaurants in the city, Full Beard didn’t officially have its own brewing facility until January 2017. The brewery is open daily starting noon. There’s a big patio which is a good place to chill and have some of their beers. 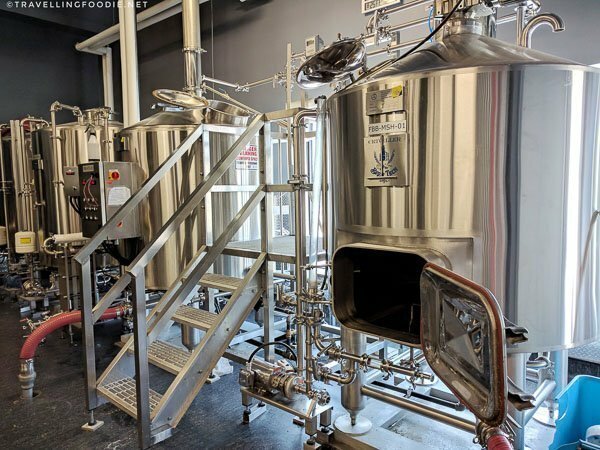 Inside is an open concept space where to your right is the open-space brewery and the counter with various taps to have your beer fresh from the keg. Milled grains are put in a long hot bath (mashing) in the mash ton. 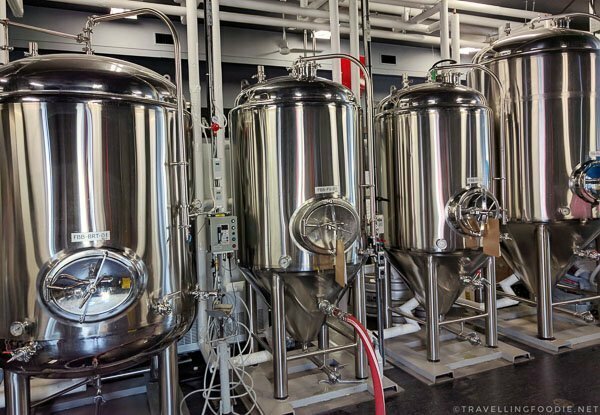 Fermentation tanks are where the yeasts are added to convert the liquid into beer. Did you know? The taps on the counter are made by owner Jon’s other business, Tap It!. To the left are more seating areas with tables that have a booklet of their beers and a story behind the name of the beer. Straight ahead are various merchandises that you can buy. If you like less hoppy beer like me, I highly recommend their Bearded Prospector, Aussie, Aussie, Aussie, Eh, Eh, Eh! and the Strawberry Stout. They also have an interesting beer called Switch-A-Roo which uses a different hop on every brew. 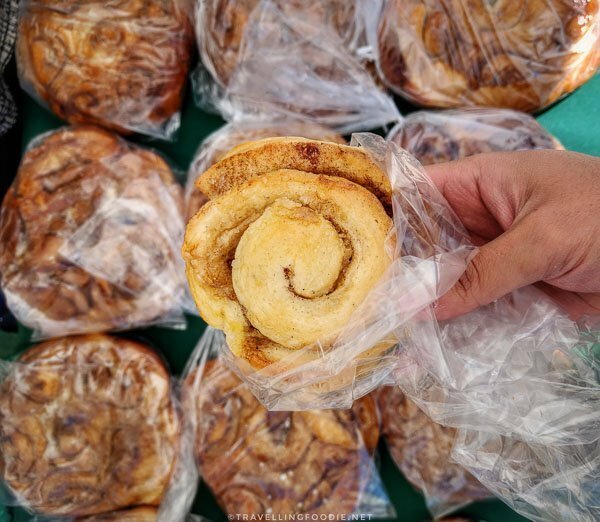 Recognized as the largest food market in Northeastern Ontario, the Urban Park Market showcases food and products from local vendors from Timmins and across Northern Ontario. The market runs every Thursday during the summer. The market opens by the ringing of the bell, a unique opportunity I got the honour of doing during my visit. Usually at least 10 vendors are present in the market. Though majority focused on food, there were some interesting non-food vendors. For example, Dream Acres Alpacas sold a variety of Alpaca products like hats, mittens, socks, and more. They even brought an alpaca for people to see and can pet. I got to try food from a couple of vendors before heading for lunch (yes – gotta have that pre-eat lol). Fromagerie Kapuskoise offered samples of their artisan cheeses. I loved their 1 year old Mattagami Cheese which sold out pretty fast. 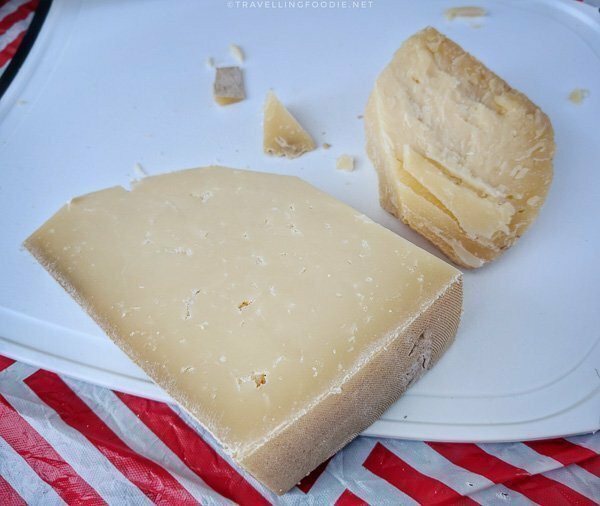 I also enjoyed their Opasatika cheese which I bought to bring back to Toronto. Acres of Dreams were selling farm fresh graded eggs, boxes of chicken or steak, and their popular pepperetes. Their hot pepperetes were so flavourful and juicy! It’s such a great snack to enjoy. I also got to try some Finnish Coffee Bread from Kayla’s Finnish Bakery. It sort of reminded me of cinnamon buns but less sweet and has a chewier bite. One thing that is distinct about Finnish bread is the use of cardamom. I also got to meet Mike of Double R & P, a birch syrup farm in Timmins, and got to learn about birch trees, syrup and chaga teas. Unlike maple syrup which is a form of sucrose, birch tree is a form of fructose and requires three times longer to boil. Did you know? 120 gallons of sap from birch trees are needed to make 1 gallon of birch syrup. 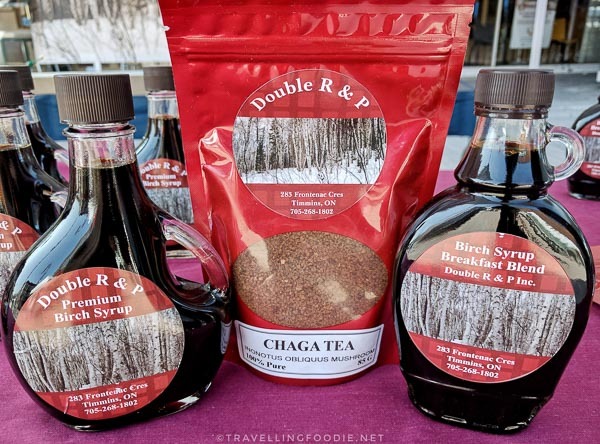 Chaga teas are actually from mushrooms that grow from birch trees. 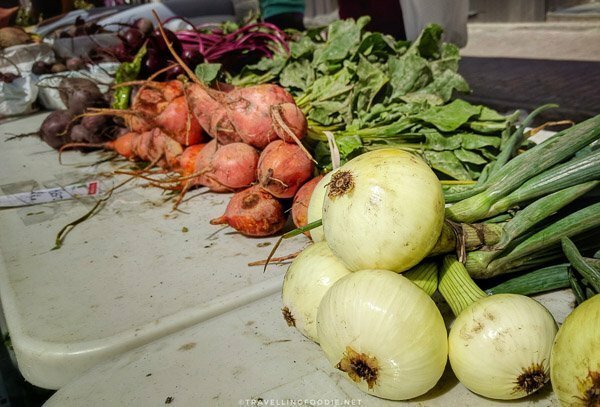 Graham Acres grow and produce their vegetables in an organically sustainable environment. Their produce is used in Coffee Warehouse juices as well. 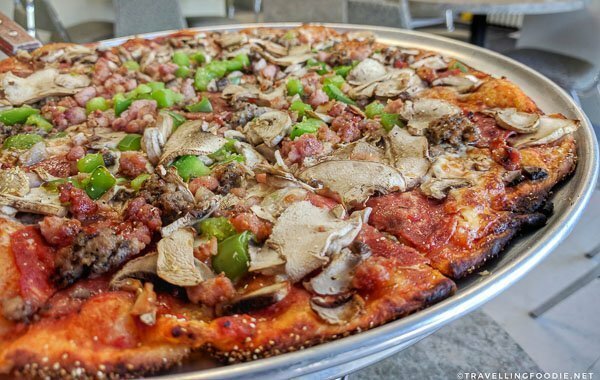 Established in November 1966, Don’s Pizzeria is one of Timmins’ landmark restaurants, and one of the few remaining family-run pizza joints as others have not been able to compete with the pizza chains. Did you know? Don’s Pizzeria is Shania Twain’s favourite pizza joint! Don’s is famous for their Specialty Pizzas featuring their original thin crispy crust baked to golden brown. I love thin crust pizzas and was so happy with the Super Don’s Special. I loved their crust because it’s the real deal thin crust, and not the cracker-like thin crust most places do nowadays. One of my pet peeves with pizza is when you’re mostly eating dough, but not in this case as the pizza is loaded with fresh toppings. They even add corn meal to the bottom of the pizza for an even added crunch. From what I was told, people away from Timmins crave their pizza so much that Don’s Pizzeria actually started doing pizza deliveries via Purolator. They half-bake the pizza then do a rush air delivery with instructions on how to finish baking the pizza. 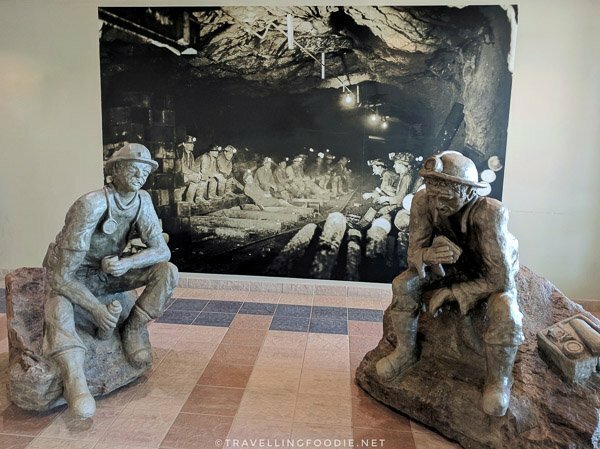 When the Timmins Underground Mine Tour was closed and sold three years ago for the operations of the Hollinger Open Pit mine, the tour’s mine artifacts, buildings and statue collections needed a new place to stay. Tourism Timmins has decided to scatter them across points of interests throughout the city. 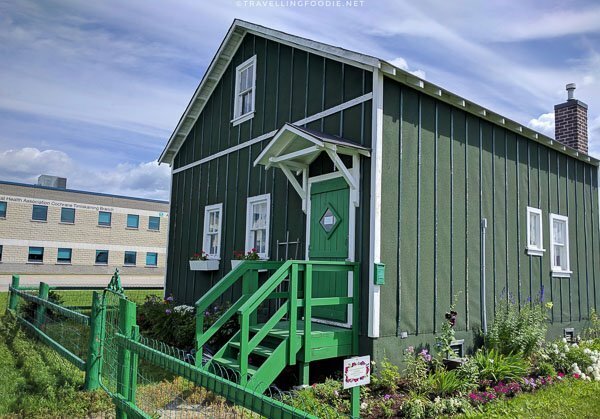 All That Glitters Is Gold: A Self-Guided City of Timmins Mining Heritage Tour is a great way to tour the city and learn about its rich mining history. 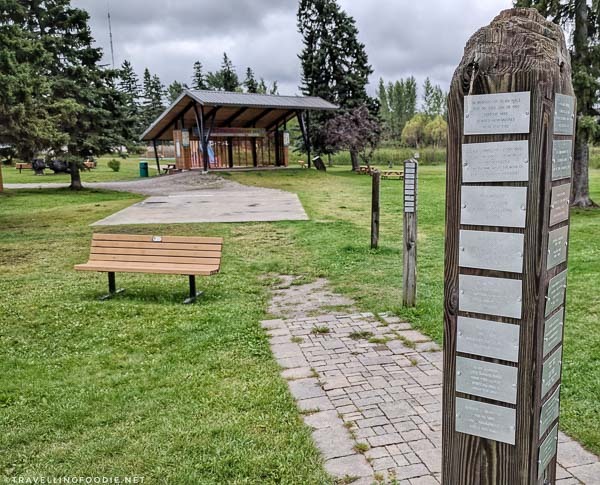 The Porcupine Miner’s Memorial is a testament to how strong the mining heritage is. 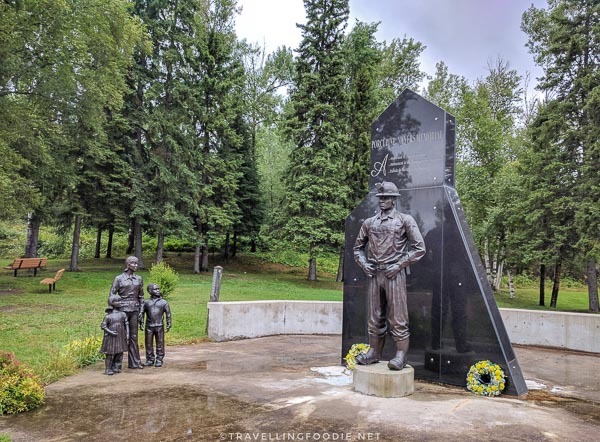 Built solely from fundraising efforts of the Porcupine Miner’s Memorial Committee, including donations from local contractors, this memorial stands as a tribute to miners who have died in mining accidents. Porcupine Miner’s Memorial at McIntyre Park. There are tablets bearing names of at least 594 miners who have died in mining accidents. 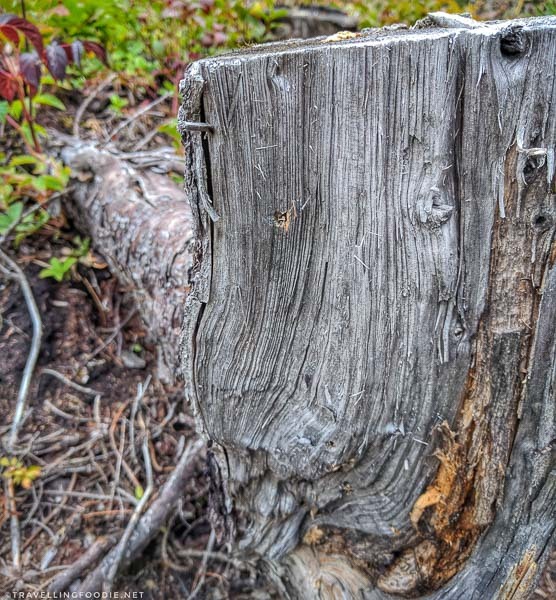 Claimposts are scattered around the Porcupine Miner’s Memorial. People can buy engraved claim tags to be put on the claimposts as gifts or recognition and tribute to loved ones that have passed. 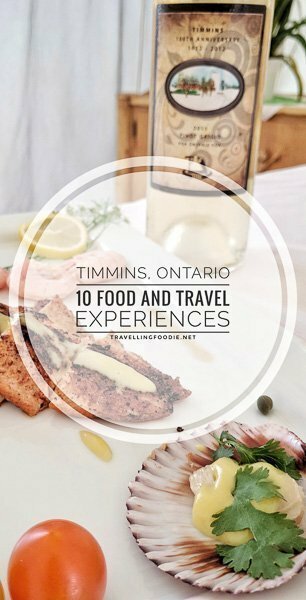 Hope this gives you some idea on the what to do, where to eat and stay in Timmins, Ontario! Let me know what your favourites are. DISCLAIMER: Though all the experiences were complimentary as part of the press trip with Tourism Timmins, all opinions are my own. 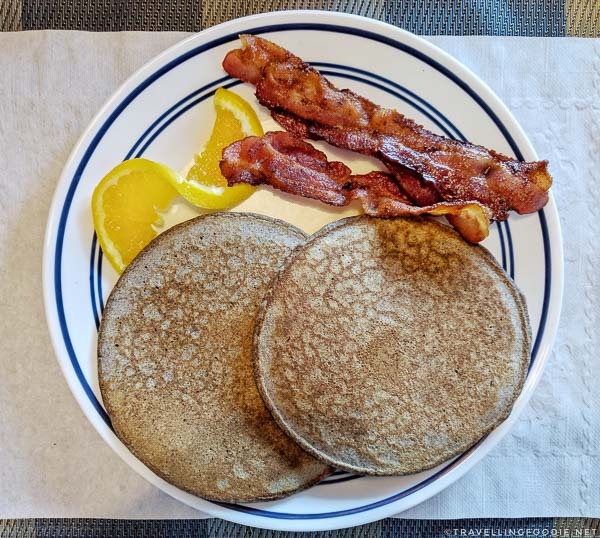 Posted on September 12, 2017 January 5, 2019 by Travelling FoodiePosted in Canada, Food, Ontario, Sudbury, Timmins, TravelTagged guides, nature, people, restaurants, sights and landmarks, tours, transportation.